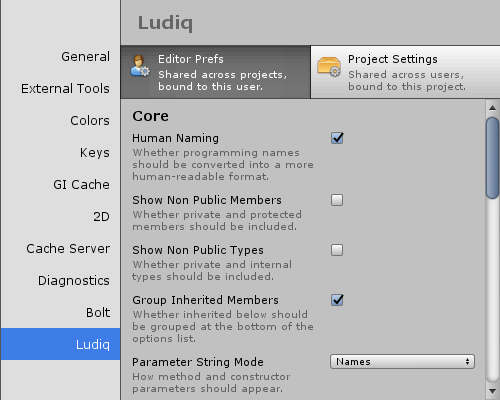 Project Settings are, on the contrary, shared with your team over version control. However, they belong to each project and won’t be shared if you use Bolt in another project. Each option has a tooltip explaining what it does, so feel free to explore and configure Bolt to your liking. If you’re not sure what an option does, you can safely leave it to its default value for now. Some options require a restart. Currently, this isn’t clearly indicated. If you find that your configuration change hasn’t been applied, try restarting the editor.